Trump declares victory at NATO, says U.S. now "treated fairly"
BRUSSELS -- President Trump appeared to declare victory Thursday in his battle with America's closest allies to get them to contribute more money to the NATO alliance. Mr. Trump acknowledged that he had taken a tough stance with his European counterparts, demanding they contribute more of their national budgets to defense and saying after Thursday's meetings, "they upped their commitments and I am very happy." He said the NATO member states had committed to quickly increase their national spending on defense to the benchmark of 2 percent of national GDP, as agreed in 2014, pending, in some cases, approvals from their respective legislatures, but he also suggested longer term commitments to raise that bar further. "We really accomplished a lot with respect to NATO. For years, presidents have been coming to these meetings and talked about the tremendous expense for the U.S. And tremendous progress has been made – everyone has agreed to substantially up their commitment. They're going to up it at levels that they've never thought of before," Mr. Trump said. "Everybody in that room got along, and they agreed to pay more, and they agreed to pay it more quickly," the president said, adding that when he came to Brussels at the beginning of the week, the "United States was not being treated fairly, but now we are." Mr. Trump took a lion's share of the credit for making a "much stronger NATO than it was yesterday," adding that his fellow heads of state were "grateful" to him for drawing more money into the transatlantic alliances' coffers. French President Emmanuel Macron, however, told reporters in Brussels after Mr. Trump's remarks that NATO member states had made no commitments at this week's summit to increase defense spending beyond the 2 percent of GDP goal which has been in place for almost four years. "There is a communique that was published yesterday. It's very detailed," said Macron. "It confirms the goal of 2 percent by 2024. That's all." Less than an hour before Mr. Trump addressed reporters in the hastily called news conference, NATO leaders reportedly declared an emergency session over the U.S. leader's hammering of America's allies over their defense spending. In a series of tweets from the Belgian capital before Thursday's meetings, Mr. Trump complained the United States "pays tens of Billions of Dollars too much to subsidize Europe" and demanded that members of the military alliance meet their pledge to spend 2 percent of GDP on defense, which "must ultimately go to 4%!" During his news conference, Mr. Trump did not specifically reiterate the 4 percent demand or suggest a timetable for increasing the 2 percent defense spending target, but he alluded to it, saying "ultimately" national contribution levels "will be going up quite a bit higher than" the current goal. Sources familiar with the first round of closed-door talks Thursday told the Reuters news agency that Mr. Trump carried his firm stance on spending from Twitter into the meeting rooms. 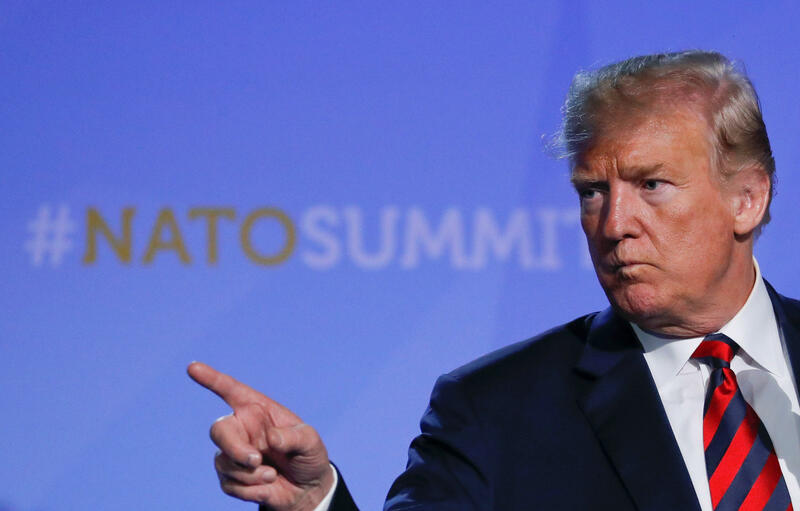 According to one Reuters source, Mr. Trump, "forcibly restated his position on wanting NATO members to reach 2 percent spending target to a short a deadline." The Reuters sources said Mr. Trump did not go as far as to threaten to pull the United States out of the transatlantic defense alliance -- as some European organizations reported -- but officials told the Associated Press that his demands for increased national defense spending were enough to prompt NATO officials to declare an emergency session in Brussels on Thursday. The U.S. president has taken an aggressive tone during the summit, questioning the value of an alliance that has defined decades of American foreign policy, torching an ally and calling for a massive increase in European defense spending. White House officials announced that Mr. Trump would give an unscheduled news conference on Thursday in Brussels amid the tumult over his demands for increased spending. Under fire for his warm embrace of Russia's Vladimir Putin, Mr. Trump on Wednesday turned a harsh spotlight on Germany's own ties to Russia, alleging that a natural gas pipeline venture with Moscow has left Angela Merkel's government "totally controlled" and "captive" to Russia. He continued that attack Thursday, complaining that, "Germany just started paying Russia, the country they want protection from, Billions of Dollars for their Energy needs coming out of a new pipeline from Russia." "Not acceptable!" he railed before arriving late at NATO headquarters for a morning of meetings that will include talks with the leaders of Azerbaijan, Romania, Ukraine and Georgia. In the afternoon, he heads to his next stop: the United Kingdom. The tough rhetoric against a core ally comes just days before Mr. Trump is set to meet one-on-one with Putin in Finland. With scorching language, Mr. Trump questioned the necessity of the alliance that formed a bulwark against Soviet aggression, tweeting after a day of contentious meetings: "What good is NATO if Germany is paying Russia billions of dollars for gas and energy?" During the meetings, he demanded via a tweet that NATO countries "Must pay 2% of GDP IMMEDIATELY, not by 2025" and then rattled them further by privately suggesting member nations should spend 4 percent of their gross domestic product on defense -- a bigger share than even the United States currently pays, according to NATO statistics. It was the most recent in a series of demands and insults that critics fear will undermine a decades-old alliance launched to counterbalance Soviet aggressions. And it comes just days before Mr. Trump sits down with Putin at the conclusion of his closely watched European trip. Mr. Trump has spent weeks berating members of the alliance for failing to spend enough of their money on defense, accusing Europe of freeloading off the U.S. and raising doubts about whether he would come to members' defense if they were ever attacked. Amid the tumult, British Prime Minister Theresa May sounded a call for solidarity among the allies, saying, "As we engage Russia we must do so from a position of unity and strength -- holding out hope for a better future, but also clear and unwavering on where Russia needs to change its behavior for this to become a reality. And, as long as Russia persists in its efforts to undermine our interests and values, we must continue to deter and counter them." From Brussels, Mr. Trump heads to England, where May's government is in turmoil over her plans for exiting the European Union. Instead, a series of events -- a black-tie dinner with business leaders, a meeting with May and an audience with Queen Elizabeth II -- will happen outside the bustling city, where Mayor Sadiq Khan has been in a verbal battle with Mr. Trump.